recently on TV we heard that the average person in France consumes around 13 liters of soups per year, Fabien and I looked at each other, giggled and said “yeah, right, we probably have 13 liters per month!” :D I guess we do raise the national average by far. As you probably know by now, we have tons of soups in this house and I mostly just make my own recipes as I go. But when one really stands out I can’t help but write it down, make it again the following day – and share it with you, too. 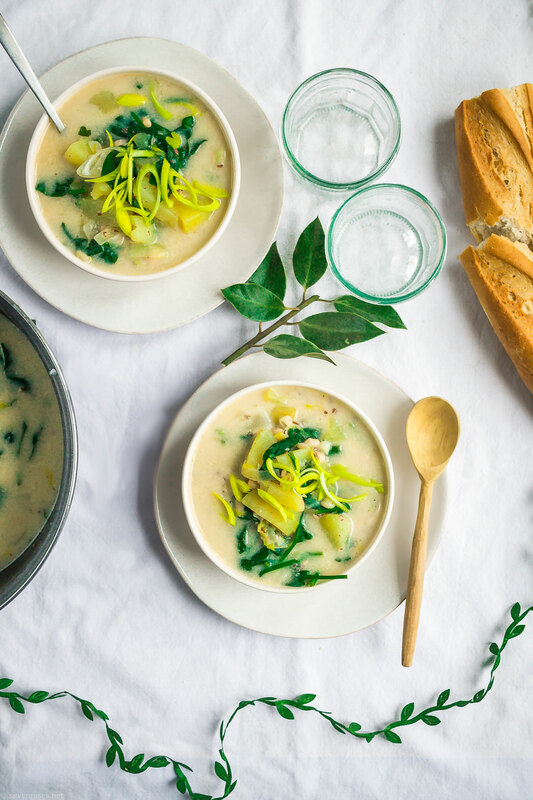 I hope you’re still into soups as this long, cold Winter slowly fades into Spring (?) 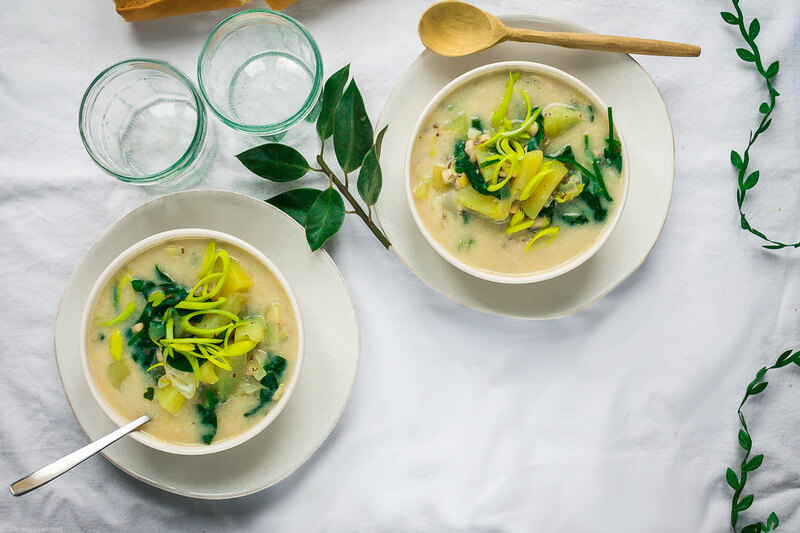 because this soup is SO good, SO hearty, SO filling, and the perfect transition from a heavier Winter soup to a Springtime soup. 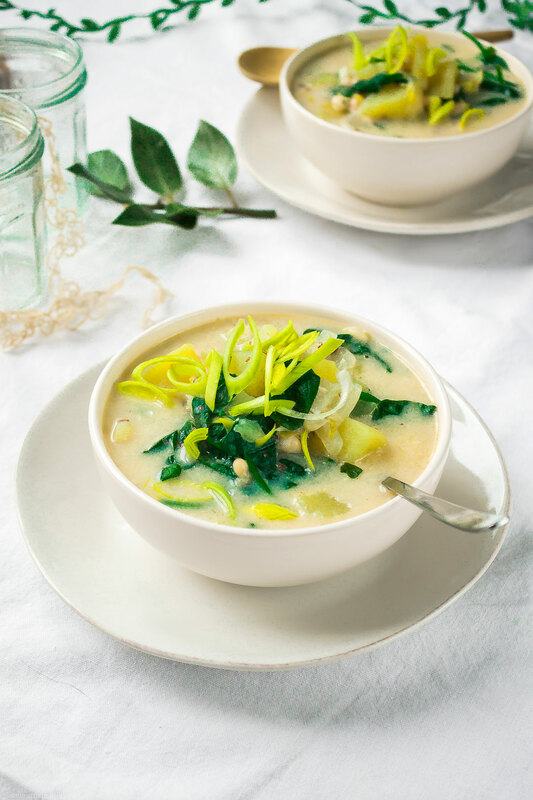 This Colcannon-inspired Vegan Potato soup recipe came to life while trying out a veganized version of Colcannon, but me being me I started playing around with ingredients, adding here, removing there, and in as little as 25 minutes my best soup was born. Et ça tombe bien (perfect timing!) 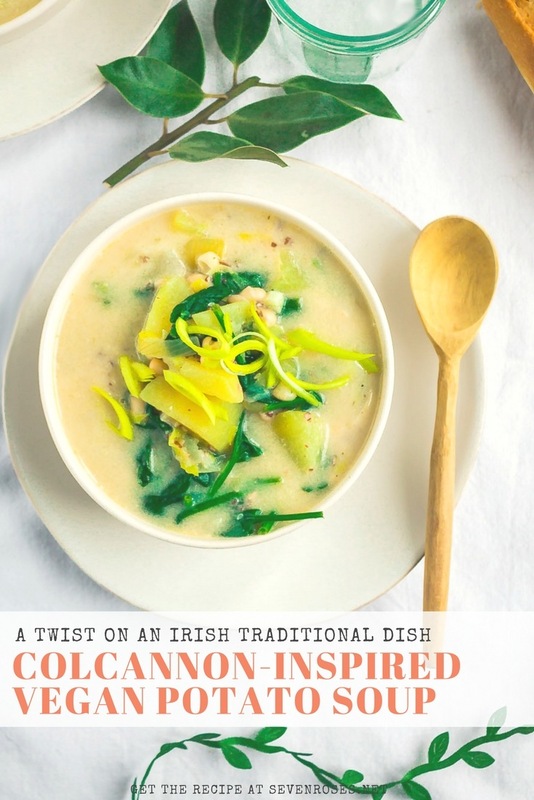 as St. Patrick’s is approaching and I think I’ll be serving this followed by my Vegan Bailey’s Irish cream as dessert, to celebrate along with our leprechaun friends (or if instead you want the greenest soup there ever was, check out my Split Pea and Spinach creamy soup (with benefits). 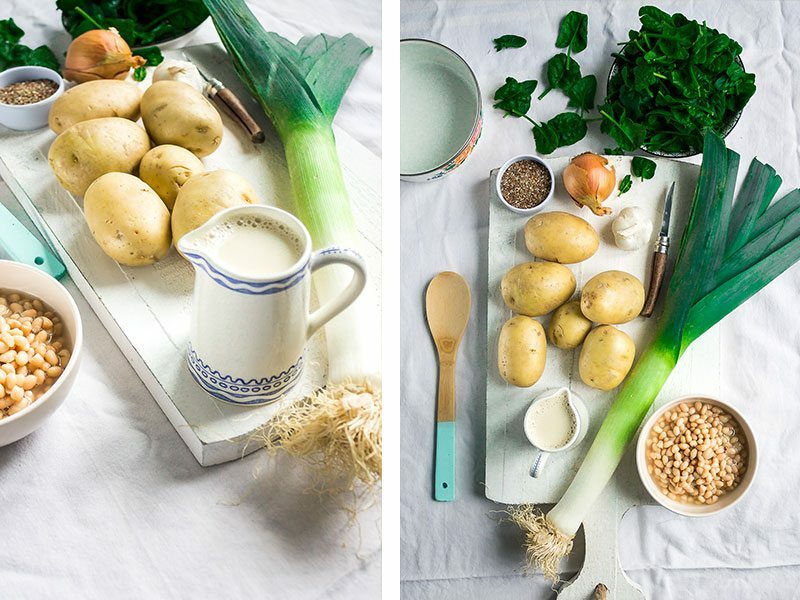 Originally the soup was made with Flageolet beans, but as I’m not sure how widely available they are, I’ve later used cannellini beans with the same creamy result, so you can use one or the other, depending on what you find. By the way, did I ever tell you that Ireland is the most beautiful place I’ve ever visited? Specifically the Galway/western coast region. After many years it still holds a special place in my heart. But enough talking, let’s get cooking, shall we? In a large soup pot, heat 2 tbs oil and 2 tbs water, then add the sliced leek, the chopped onion and the minced garlic cloves. Let them cook 2/3 minutes. Add the chunks of potatoes as you cut them (in this way the first chunks will be slightly more cooked than the last, thus giving a multitude of textures) and the pepper, stir well. Then add the 6 cups of water, the bouillon cube, the drained cannellini or Flageolet beans. Let cook for about 20 minutes on medium heat, with the lid on to reduce evaporation until the potatoes are soft and start to break apart. Chopping the potatoes in different sizes will result in big chunks to bite into, and smaller ones that give the soup a special creamy texture. After 20 minutes, add the fresh spinach leaves, the soy cream and the ground seeds, stir well one last time and turn the stove off. 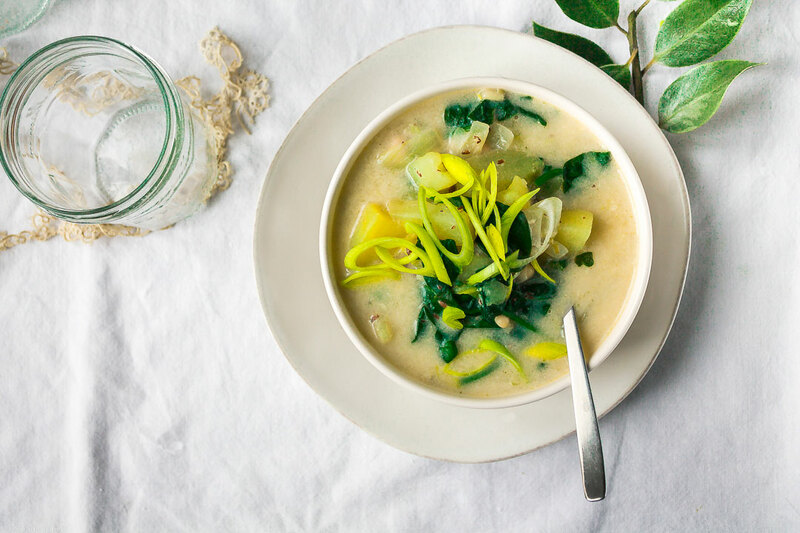 Let rest for 2 minutes (or more) for a more flavorful soup. Serve with a sprinkle of freshly ground pepper, or an additional swirl of soy cream. Enjoy! If you prefer a creamy texture, use an immersion blender and mix part or all of the soup. 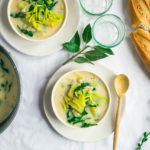 If you (want to) give this Colcannon-inspired Vegan Potato soup recipe a try, please let me know in the comments’ section below! Very interesting read! I enjoy reading about soup. Thanks for sharing your perspective!